The Camarilla, oh what a strange history I have with thee. 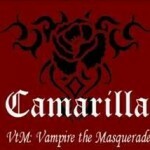 I claim as part of my geek cred that I am one of the founders of the Camarilla. Seeing as we are into the Halloween season now, it seems like as good a time as any to explain that. 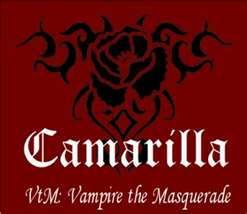 For those not in the know, the Camarilla is a fan organization based on White Wolf’s Vampire role-playing game that came out in 1991. So how did a role-playing game end up with an international fan organization? Let me give you my eye witness account, my personal journey if you will. I’m going to use Vampire game terms liberally. I’m not going to take the time to explain them, I figure most of you can use Wikipedia. Oh and in case there is some confusion, events in the last couple of years required them to change the official name of the organization to the Mind’s Eye Society. Since I’m talking about from further back I am just going to call it the Camarilla. Within 6 months of the game’s release a good friend of mine named Matthew Burke informed me that he had been talking with a co-worker of his named Jana Wright and they had decided that they were going to form the official fan club, and wanted to know if I was willing to help. I was a fan of the game, having both played and run a few games since its release. Sure, I was in. Now I want to back track here a bit. I think it is worth going over how I knew Matt and how that informed how the Camarilla was formed. Matt and I met in a Star Trek fan club. You see there is this really big fan club called STARFLEET International (Apparently the all caps thing is required). It’s the big Star Trek fan club with branches all over the world. The structure of the club was that all chapters were designated as ships and would be named after whatever they called their ship. This also played into a role-playing element as members of the club would have Star Trek universe persona’s and the clubs officials would also have ranks like Captain, First officer, Chief Medical officer, etc. When a chapter was just starting out it would be called a shuttle and would need an existing ship to be its sponsor until it was cleared to full ship status. Trust me this will become relevant. So our little Star Trek club was called the USS Courageous, which quickly became the main chapter in the Seattle area. I was the Chief Medical Officer, which in real life meant I was in-charge of organizing club social events. Matt joined and became Helmsman, which if I remember meant he helped with club operations. We became friends pretty quickly and hung out a lot. And before you ask, yes we had costumes, and no I do not still have mine. If there are pictures I do not know where they are, or I would be posting them here right now. So anyway back to the Camarilla. The original group that came together to get this club off the ground was a mix of officers from the Courageous and friends of Jana, many of whom were from the Goth community. Matt had reached out to White Wolf and they were more than happy to let us form an official club for their game. So how do you go about creating a fan organization? To Matt’s credit he had an amazingly simple plan, don’t reinvent the wheel. Many of us were part of a successful fan organization based on an existing property, so why not follow their lead. And by follow their lead I mean take their membership materials and replace all Star Trek references with vampire ones. I’m serious; there was some confusion on some early members’ part when they asked why there was a reference to a ship in a couple of places in their membership materials. Chapters were called Houses, and probationary Houses were called coteries and would need an existing House to be its sponsor until it was cleared to full House status. In case you were wondering, I did copy and paste part of that last sentence. So yes, the Camarilla is the most successful off shoot of STARFLEET International. Yes we beat out the Klingon Empire and the Terran Empire. Matt’s plan was that the Camarilla would be a club that did fundraising and public service, just like STARFLEET did as well as the role-playing aspect. One small problem with that plan, when you base a fan club on a role-playing game guess what the members are going to be most interested in. Hint, it’s not volunteering for an adopt-a-highway program. So gaming, specifically live action role-playing or LARPing, was clearly the heart of the organization. The great strength of the Camarilla was the worldwide chronicle where in-game events happening to us in Seattle was in canon with in-game events happening in Chicago and London. We started with a home-brewed gaming system based on Vampire the Masquerade, but quickly moved over to Mind’s Eye Theater once White Wolf released it. It’s at this point I want to talk about the board of directors. In game they were the Inner Circle of the Camarilla and were amongst the oldest and most powerful vampires in the in-game world. My good friend Matt as Club President was the Patriarch of the Inner Circle Dorian Strack, who was also Prince of Seattle. At first I was not on the board. I was serving as Matt’s assistant and special advisor to the board. Also I was working with Matt on an idea to also produce a Vampire comic book to propose to White Wolf. My Character was Caliban, a Gangrel and one of Dorian’s enforcers. Yes, this is where I got the name from. Why Caliban? Clearly the Shakespeare reference as Caliban saw himself as a beast but could also be intelligent. Also Matt took the name Dorian, which was what I was going to use, but he was the boss. So part of the idea was that each board member was also the representative of their clan on the Inner Circle. Why is this important? Not long after the official kickoff event for the Camarilla, but right before we open up membership, the board member in charge of the organization newsletter just up and disappeared. We literally lost contact with him. To this day I have no idea what happened to him. As I majored in journalism in college it was natural to make me his replacement. However this meant I had to retcon Caliban into a Brujha. So the Camarilla was off and running. And it was met with a lot of initial success. People really liked the game and so it was easy to generate interest, particularly at conventions. The Board of Directors learned a lot during that time about what was needed to run a quickly growing organization. I would say that we did fairly well. However there were some challenges. Some people found that it was more stress then they had counted on and left. Others were lured away by a more daunting challenge, a career. When Matt contacted White Wolf about forming the Camarilla he was informed that one of the people that worked on the original game was working in the Seattle are, Lisa Stevens. Lisa had come to the area to work for Wizards of the Coast. Matt contacted her and she started attending Board of Director meetings. Lisa also invited members of the Board to visit WotC as they had open staff meetings at the time. This was almost about nine months to a year before the release of Magic: The Gathering so it was still a small company running out of Peter Adkison’s basement. A few of us went, but I was really the only one who started going to these meetings regularly, and I even started helping out on projects there. Eventually the summer of 1993 rolled around and with it the release of Magic: The Gathering. WotC had a spare airplane ticket, and so they took me with them to GenCon that year and based on the massive response to the game Peter hired me full time at the convention. So suddenly I am working for a game company that is growing rapidly. This did not leave a lot of spare time and within a couple of months I officially left the Board due to time constraints. I’d like to point out that I had only left the board; I was still a Camarilla member and got to keep using Caliban as my character. If it had just been me that might have been one thing, but due to WotC’s growth they needed more people and since there were strong connections between WotC and the Camarilla board several other board members, Including Matt and Jana, were hired over the next several months. Some of the board members felt the same time management issues I did and decided to also step away from the board, but like me were still active in the organization as members. A couple balanced both; how they did this I have no idea. Due to this eventually it was decided that a whole new board was needed. I was not involved in these decisions so I don’t know how it came to pass, but it was decided that the Camarilla group in Salt Lake City was to take over the duties as Board of Directors. At this point any knowledge I have about how the Camarilla was run would be third hand at best. I did stay an active member more or less until about 2004. I won’t go into why I left other than to say it was a combination of burn out and some personal issues. The truth is that it was a good idea and it has given a lot of people a lot of joy over the years. People met other people that they would have never met otherwise. This means friendships and even marriages happen because it exists. Other than a couple of people I hang out with that I knew before it was formed, my entire social circle can be traced either directly to the Camarilla or to WotC which itself I can trace to the Camarilla. Because of this I met my wife, found my job which I like, discovered a sister and associated family that I love, and had a host of amazing experiences. Heck even my entertainment comes from the Camarilla. I have mentioned before that I am a fan of an internet streaming show called Radio Dead Air. The host Nash is a Camarilla member and started the show as an in-character radio show in his local game. So that is my tale of the birth of the Camarilla, as I recall it. Of course other board members from that time may remember things differently. So to them I make this offer. If any of the other founding board members have a different take on the early days, or just want to write up their memories of what happened, I will give you your say. Write up what you remember and send it to me. I promise I will publish it here on Fanboy News Network completely unedited. As I said a lot of interesting things happened during my time in the Camarilla. One day I might dip into that vault and tell another tale. Believe me there was a lot. This entry was posted in Storytime and tagged Camarilla, Gaming, Geek Culture, Radio Dead Air, Vampire, White Wolf, WotC by Caliban. Bookmark the permalink.